Presiding Judge Daisuke Kanda said in the decision that there was no objective evidence to link the men to the crime, noting that hairs and fingerprints detected at the crime scene didn't match them. Kanda also said witness accounts placing the two men at the victim's home lacked credibility. It is the seventh postwar case involving an acquittal in a retrial of defendants sentenced to death or life imprisonment. The two were arrested in October 1967, indicted that December and sentenced to life in October 1970 over the so-called Fukawa murder case, named after the crime site in the town of Tone, Ibaraki Prefecture. Sugiyama, who earlier in the day spoke to reporters at his home in Kawasaki, said he was unhappy with a mere not guilty decision and hoped the court would look into prosecutors' concealment of evidence that could have helped acquit the pair. Sakurai noted that a not guilty verdict was a natural decision. The three-judge panel held six rounds of hearings in the two men's retrial starting in July 2010, when they pleaded innocent. Their lawyers a tape recording of investigators interrogating Sakurai and argued that the tape had been edited. The defense also contended that investigators coerced Sakurai into confessing. A 78-year-old woman, who saw a man at the crime scene, testified at the retrial that the man was not Sugiyama. During the original trial, the two pleaded innocent, arguing that police investigators had forced them to confess. But the district court's Tsuchiura branch, citing their confessions and witness accounts, found them guilty and sentenced them to life in October 1970. The decision was upheld by the Tokyo High Court in 1973 and later by the Supreme Court in 1978. They were released on parole in November 1996. The two first filed for a retrial in 1983 while in prison but were rejected. They filed for a retrial a second time in 2001 after being freed. In September 2005, the district court's Tsuchiura branch accepted the petition and decided to launch a retrial — a decision upheld by the Tokyo High Court in July 2008 and then by the top court in December 2009. In the retrial, prosecutors again sought life for both of them, arguing they had confessed voluntarily and their depositions were credible. The prosecutors called for conducting a DNA test on four items of evidence, including underwear found wrapped around the victim's neck, but the court turned down the request. The court was initially scheduled to hand down its decision March 16, but put off the date to Tuesday following the March 11 earthquake and tsunami that crippled railways and other mass transit systems in the region. One of the defendants, Sakurai, worked as a volunteer at shelters in the quake-hit city of Ishinomaki, Miyagi Prefecture, after the March disaster. In the audience at the courtroom Tuesday was Toshikazu Sugaya, 64, who was also acquitted in a 2009 retrial after spending 17 years in prison for allegedly killing a kindergarten child in 1960. TSUCHIURA, Ibaraki -- Two men who spent nearly three decades behind bars over the killing of a 62-year-old man in August 1967 were acquitted in a district court retrial on May 24. Found not guilty were Shoji Sakurai and Takao Sugiyama, both 64. Prior to the ruling at the Tsuchiura branch of the Mito District Court on May 24, Sakurai had said he would focus on whether the court would accurately judge public prosecutors' actions. Sugiyama, meanwhile had said he wanted the ruling to take into account prosecutors' concealment of evidence. Both men had already been released on parole from life sentences, after 29 years' imprisonment. The killing of 62-year-old Shoten Tamamura took place in the Ibaraki Prefecture town of Tone in August 1967. There was no evidence directly linking Sakurai and Sugiyama to the crime, but they were convicted based on "confessions" obtained during the investigation stage of the case, and the testimony of a resident who said that they saw the pair. During investigations, the pair made a "confession" stating that they robbed the victim of 110,000 yen and murdered him. They denied this during the trial but in 1978 the Supreme Court upheld a guilty verdict against them that sentenced them to life imprisonment. In retrial hearings that began in July last year, focus was placed on the credibility of the alleged confessions, the witness's testimony, and new testimony from a woman who said she saw a different person in the area near where the crime took place. This woman appeared in court for the first time during the retrial hearings -- 43 years after the killing took place. Based on the circumstances and traces of editing on the tapes containing the men's confessions, lawyers for the men argued that they had been forced to confess and that police and prosecutors had hidden evidence that they were innocent to form a case against them. In the retrial, they asked the court to restore the men's reputations and clarify what led to the false charges, saying, the courts that accepted investigators' arguments also bore a heavy responsibility. Prosecutors had tried to prove that the men were guilty, seeking DNA tests on a towel found near the victim, but the Tsuchiura branch of the Mito District Court rejected their request, and the focus of the retrial subsequently shifted to the credibility of the alleged confessions and witnesses' testimony. Prosecutors argued that there had been major changes in the woman's testimony. The acquittal marked the seventh case in the postwar era for a defendant sentenced to death or life imprisonment to be acquitted in a retrial. The last acquittal in such a case was in March last year, when Toshikazu Sugaya was found not guilty of committing a murder in Ashikaga, Tochigi Prefecture, in 1990, after spending 17 years behind bars. In that case, renewed DNA tests indicated Sugaya was not guilty of the crime, and prosecutors also argued that he should be acquitted. Prosecutors on Friday again sought life sentences for two men who are seeking acquittals in a retrial after spending nearly 30 years in prison for a 1967 murder-robbery case in Ibaraki Prefecture. The two—Shoji Sakurai, 63, and Takao Sugiyama, 64—were sentenced to life imprisonment in their original trial for murder, known as the Fukawa Incident, and were released on parole in 1996. The prosecutors said in their closing argument at the Tsuchiura branch of the Mito District Court their confessions to the investigators during the interrogations are highly credible, although the branch expressed doubts about the credibility when it decided to reopen the case in 2005. The two are expected to be found innocent when the court hands down a ruling as early as next spring, as no material evidence, such as fingerprints, has been presented to link them to the crime. Two men who spent nearly 30 years in prison after being convicted in a 1967 murder-robbery case are expected to be acquitted in a retrial soon, legal experts said Friday. The prospect emerged after a three-judge panel rejected prosecutors’ request the same day to conduct a DNA test on four items of evidence in the crime, known as the Fukawa murder case, named after the site in the town of Tone, Ibaraki Prefecture. The two are Shoji Sakurai and Takao Sugiyama, both 63, who were sentenced to life imprisonment but were freed on parole in 1996. During their original trial, the two pleaded innocent, saying that police investigators had forced them to confess to the crime. They again pleaded innocent at the first hearing of their retrial on July 9 this year. In Friday’s second hearing, a tape that recorded the investigators’ grilling of Sakurai was played. The defense counsel said the tape was found to have been edited in 13 places, arguing that investigators led Sakurai to confess to the crime. An acoustics expert in Osaka Prefecture analyzed the tape in 2006 during a hearing on the two men’s plea for a retrial at the Tokyo High Court. The Fukawa murder case involved the murder and robbery of Shoten Tamamura, a 62-year-old carpenter, in Tone in August 1967. Sakurai and Sugiyama, who were in their early 20s at that time, were arrested later that year and charged with killing the carpenter and stealing about 100,000 yen. Despite their plea of innocence and claim that investigators had forced them to confess to the crime, the district court’s Tsuchiura branch declared them guilty and sentenced them in 1970 to life in prison—a decision upheld by the Tokyo High Court in 1973 and the Supreme Court in 1978. Sakurai (in jacket and tie at left) and Sugiyama (in tie at right) celebrate the Tokyo High Court's decision to reopen their 1967 conviction for murder and robbery. The Supreme Court has decided to open a retrial of two men convicted of murder that occurred in the Fukawa district of Tone, Ibaraki Prefecture, in 1967. The two men, Shoji Sakurai, 62, and Takao Sugiyama, 63, have been released on parole after serving their life prison terms. The credibility of their confessions was the focus of contention during court deliberations on whether to open a retrial: unlike the widely-publicized Ashikaga case, in which a new DNA test strongly suggested the convict is not the perpetrator and prompted a retrial, no evidence clearly showing the convicts in the Fukawa case are innocent has been found. However, the Tokyo High Court and the Supreme Court made their decisions after comprehensively examining new evidence submitted after the two demanded a retrial, and evidence on which they were found guilty. The Supreme Court decided in 1975 to open a retrial of the convict in the so-called Shiratori case on the grounds that the principle of "benefit of the doubt in favor of the defendant" should apply to retrials of convicts. Since then, many of those found guilty of serious offenses such as murder have been acquitted in their retrials. Since the 1990s, however, many district courts' decisions to open retrials of convicts have been overturned by high courts in response to appeals by prosecutors. However, courts can make erroneous judgments, and the latest decision by the Supreme Court, which has opened the door for new retrials, should be supported. After Sakurai and Sugiyama filed their second request for a retrial, prosecutors released new evidence -- a testimony provided by a neighbor of the incident scene to the effect that two people spotted near the scene at the time of the crime were not Sakurai and Sugiyama and an expert's opinion made by Ibaraki Prefectural Police showing that hair left near the victim's body did not match that of either of the two. One cannot help but wonder why such important evidence that raised doubts that the two committed the crime had not been released for 30 years. Under the Code of Criminal Procedure amended in 2004, defense lawyers are allowed to demand a wider scope of evidence of crime cases held by prosecutors. However, it does not require that all evidence be fully released prior to trials, as the Japan Federation of Bar Associations is demanding. Lay judges make judgments based on evidence submitted to courts. If prosecutors conceal evidence favorable to defendants, it is impossible to ensure fair trials. The way evidence is released needs to be reviewed. Prosecutors should at least be legally required to fully release all evidence they have in trials of serious crimes and retrials. The two convicts in the Fukawa case were reportedly forced to confess to the crime during questioning. The Fukawa case, as well as the Ashikaga case, has thus highlighted problems involving investigations in which investigators place too much emphasis on confessions by suspects. The courts that convicted the two should scrutinize why judges in charge failed to pay enough attention to unnatural changes in their statements on the incident. Tape recordings of their confessions during questioning were released by prosecutors after the two convicts filed their second request for a retrial, but defense lawyers subsequently found clear signs that they had been edited. The latest decision by the Supreme Court will certainly have a huge influence on discussions on the pros and cons of recording the questioning of crime suspects. Police and prosecutors are reluctant to record the whole process of interrogations. However, the revelations have demonstrated that partial recordings can allow law enforcers to alter their contents. The Tokyo High Court on Monday approved the retrial of two men who spent almost three decades behind bars for the 1967 robbery-murder of a carpenter in Tone, Ibaraki Prefecture, arguing their initial confessions had been forced. The life sentences of Shoji Sakurai and Takao Sugiyama, both 61, were finalized by the Supreme Court in 1978 for the strangling of Shoten Tamamura, 62, and robbery of some ¥100,000 in cash from the victim, whose body was found in August 1967. The two men were paroled in 1996 after spending some 29 years behind bars since their arrest. During their trial, the pair claimed investigators pressured them into confessing. They later petitioned for a retrial, denying guilt. 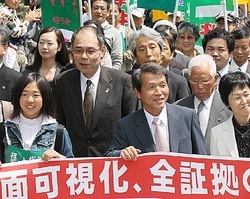 In September 2005, the Mito District Court's Tsuchiura branch accepted their petition and gave the go-ahead for the retrial. Prosecutors appealed the district court decision to the high court, which Monday endorsed the retrial bid. "Truth prevailed," Sugiyama said after the ruling. "Our battle will continue." It is uncertain if prosecutors will appeal the ruling. Presiding Judge Hiroshi Kadono said the confessions ran counter to significant facts pertaining to the slaying, including how Tamamura was killed. It appeared police pressured Sakurai and Sugiyama into making a false confession, he said, adding that a witness wrongly claimed to have seen the pair near the crime scene. The case lacked material evidence and the prosecution depended solely on the confessions. A high court on Monday upheld a lower court's decision to retry two men who were convicted of murdering a carpenter in 1967. The Tokyo High Court dismissed an appeal filed by prosecutors against a decision made by the Mito District Court's Tsuchiura branch to open a retrial of Shoji Sakurai, 61, and Takao Sugiyama, 61. "There are serious doubts about the credibility of their statement, raising reasonable doubts about the conviction," Presiding Judge Hiroshi Kadono said as he handed down the decision. It remains to be seen if prosecutors will appeal the decision to the Supreme Court. If they abandon their appeal, a retrial will open. "Finally, the court decided to open a retrial. We'll try hard (to win acquittal), so please continue to support us," Sugiyama told his supporters outside the court. "Finally, clear facts were recognized. It was a long fight. I really appreciate the support by our lawyers and supporters. Although the court decided to open a retrial, our struggle will continue," Sakurai said. Sakurai and Sugiyama were released on parole in 1996 after they were sentenced to life imprisonment and spent 18 years behind bars. Presiding Judge Kadono upheld the lower court's judgment that their statements on how they killed the victim do not match the conditions of the victim's body. He recognized new evidence presented by their lawyers indicating that the culprit stuffed underpants into the victim's mouth after strangling him. "The statements that the two made during investigations to the effect that they first put underpants in the victim's mouth, then strangled him, contradict with the facts," Kadono said. The appeal court judge also pointed out that the statements made by Sakurai and Sugiyama changed from time to time. "It is presumed that their statements changed from time to time in an unnatural way because they didn't actually experience what they confessed to doing," he said. The presiding judge also noted that their fingerprints and hair were not found at the murder scene. Furthermore, Kadono pointed to the possibility that a tape recording of their confessions had been edited, and said investigators may have led them into making confessions. The incident occurred in 1967. 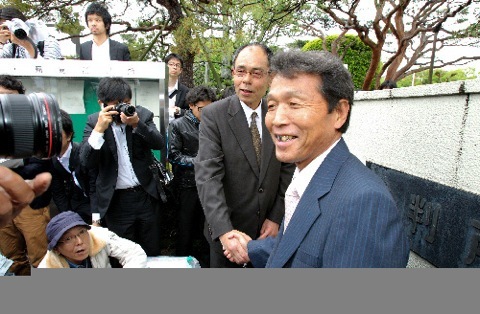 Shoten Tamamura, then 62, was murdered at his home in Tone, Ibaraki Prefecture, and about 110,000 yen was stolen from him. Ibaraki Prefectural Police arrested Sakurai and Sugiyama for murder and robbery later in the year. Sakurai and Sugiyama admitted to the allegations during investigations. However, they pleaded not guilty during their district court trial. They were sentenced to life imprisonment in 1970 and the conviction was confirmed after the Supreme Court dismissed their appeal in 1978. The Tokyo High Court approved a retrial Monday of a 1967 murder-robbery case in Tone, Ibaraki Prefecture, citing doubts about the initial confessions of the two men convicted, who had pleaded not guilty. The life sentences of the two—Shoji Sakurai and Takao Sugiyama, both 61—were finalized at the Supreme Court in 1978 for the murder of carpenter Shoten Tamamura, 62, and theft of some 100,000 yen in cash from the victim. During the trial, the two men said they made the confessions led by investigators and filed a petition for a retrial. 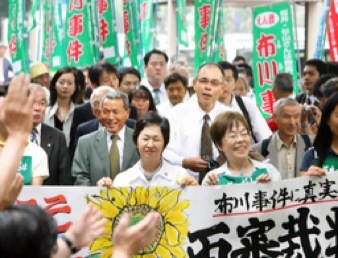 In September 2005, the Mito District Court’s Tsuchiura branch accepted their petition and gave the go-ahead for a retrial. The men were released on parole in 1996, having served some 29 years in prison since their arrest. They were convicted in the case of the victim whose strangled body was found in August 1967. The case came to be known as the ‘‘Fukawa Incident’’ in reference to the name of an area in the town of Tone. The Tokyo High Court on Monday upheld a retrial order for two men who have spent decades trying to clear their names for a 1967 murder-robbery they said they didn't commit. The court's ruling in the infamous Fukawa Incident will likely heighten scrutiny toward interrogation methods and submission of evidence by law-enforcement authorities. Presiding Judge Hiroshi Kadono said the confessions of Shoji Sakurai, now 61, and Takao Sugiyama, now 61, lacked credibility. He also said new evidence raised doubts about the guilt of the two men in the murder of a 62-year-old man at his home in the Fukawa district of Tone, Ibaraki Prefecture, 41 years ago. Legal experts and human rights activists have long called the incident a blatant case of wrongful arrest. "Many requests for retrials from wrongfully accused people are dismissed. We hope to win the Fukawa Incident and create a trend for retrials," Sugiyama said before Monday's ruling. Judge Kadono rejected the appeal of prosecutors who sought to overturn the order of the Mito District Court's Tsuchiura Branch for a retrial. If prosecutors decline to appeal the high court's decision to the Supreme Court, the retrial will be held. Kazuhiro Suzuki, a spokesman for the Tokyo High Public Prosecutors Office, described Monday's ruling as "extremely regrettable" and said prosecutors would consider what action to take after studying the ruling and consulting with the Supreme Public Prosecutors Office. According to court records, Sakurai and Sugiyama initially confessed to killing the man and stealing 107,000 yen ($1,000) in cash during the investigation into the case. While in a detention center, they reversed their statements and denied any involvement in the crime. But after they were transferred back to police, they confessed anew. During their trial, the two pleaded not guilty, arguing that police had forced them to admit to the crime. In 1978, the Supreme Court finalized the life sentences handed to the pair, saying their confessions were credible. The top court's ruling concluded the two gagged and strangled the man with their hands after he refused to loan them money. Sakurai and Sugiyama were both released on parole in 1996. Judge Kadono said Monday that he could not agree with the Supreme Court's ruling, citing "serious doubts over key evidence on which the guilty verdict is based." Kadono noted discrepancies in witness accounts. One man said he saw the two in the area at the time of the murder. But a woman who was also in the vicinity said the suspects she saw were not Sakurai and Sugiyama. Prosecutors disclosed the woman's account for the first time during the request process for a retrial. Kadono also cited a coroner's report that said the man's death was "very likely the result of being strangled with a rope-like object." He said the flip-flopping and inconsistencies in the statements of the suspects "were caused because they were not based on real-life experiences." In addition, Kadono noted that the tape recordings of the suspects' confessions, presented by prosecutors as key evidence, appeared to have been doctored. "The credibility of the confessions was questionable" and there is room to suspect the interrogators forced these confessions, the judge concluded. Following the ruling, Sakurai was greeted by a crowd of supporters outside the high court in Tokyo's Kasumigaseki district. The Mito District Court's Tsuchiura branch granted a retrial Wednesday for two parolees found guilty of robbery and murder, casting strong doubt on the evidence that led to their convictions. Shoji Sakurai (left) and Takao Sugiyama celebrate Wednesday after being granted a retrial for a robbery-murder case. Shoji Sakurai, 58, and Takao Sugiyama, 59, were sentenced to life in prison for robbing a 62-year-old carpenter and strangling him in Tone, Ibaraki Prefecture, in August 1967. The two, paroled in November 1996, have maintained their innocence, claiming they were forced to confess. The district court acknowledged that "the only direct evidence linking (the two men) and the crime is their confessions." New evidence cast doubt on the reliability of those confessions and thus the foundation of their convictions, the court said, noting there were many points in their statements that strongly suggest they were coerced by investigators. This is the year's third ruling granting a retrial. Prosecutors have appealed one of them. According to the court, one piece of newly submitted evidence shows it was highly likely the victim was strangled by some kind of fabric. The two men had said in their confessions that they used their hands to strangle the carpenter. In October 1970, the court's Tsuchiura branch sentenced both men to life, a ruling finalized when the Supreme Court rejected their appeal in July 1978. The pair first sought a retrial in 1983. The district court rejected the bid in 1987 and the Supreme Court did likewise in 1992. This was their second try. At a news conference after the ruling, lawyers for the men expressed satisfaction, saying the court acknowledged the contradictions between the confessions and the physical evidence, including the lack of their fingerprints at the crime scene, and that none of the eight strands of hair found matched those of Sakurai or Sugiyama. The lawyers also pointed out that prosecutors disclosed for the first time evidence that cast doubt on two men's confessions and witness testimony. "I hope prosecutors will not forget that their job is to seek the truth," said Hiroo Yamamoto, one of the lawyers. In a written statement, Sugiyama said he was deeply moved by the decision: "For the first time in 38 years, I have faith in the courts."